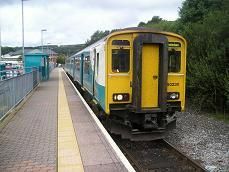 Description: The shortest branch line in Wales runs south east from Barry station. 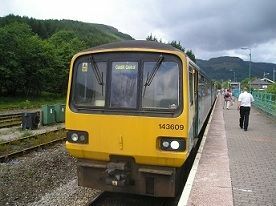 Description: This branch line runs north from Bridgend to Maesteg almost ten miles away. History: Originally opened in the 1860's, the line was closed in 1970. 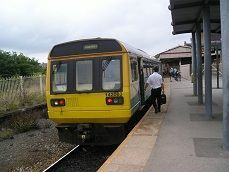 After a long campaign the line was reopened to passngers in 1992. 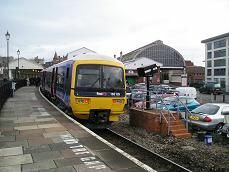 Description: The newest passenger line in Wales, opened in February 2008 on a former freight line from the South Wales mainline to the edge of Ebbw Vale. 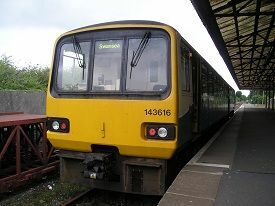 History: The line had originally opened in 1850, but passenger services ceased in April 1962. 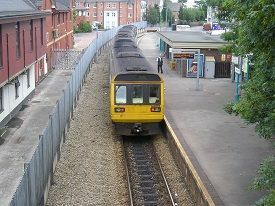 In May 2015 the line was extended north to reach Ebbw Vale Town. 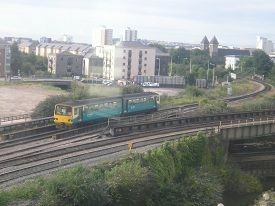 Description: This short branch line connects the redeveloped docks area of Cardiff Bay with the town centre. 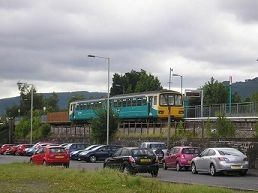 History: Originally opened by the Taff Vale railway in 1840, the terminus station was first called "Cardiff Docks", then "Bute Road" in 1924 (under the GWR) and fimally "Cardiff Bay" in 1994. 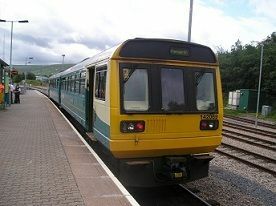 Trivia: The line uses a Class 121 "Bubble Car" DMU. Description: This branch line connects Rhymney with Penart south of Cardiff. 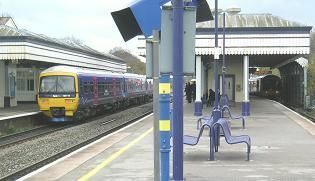 Description: This single track line goes south west from Chippenham to Trowbridge on the Bristol to London Paddington mainline. 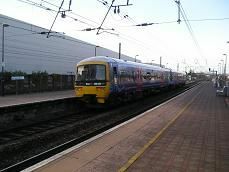 It has just two trains in each direction per day at present. 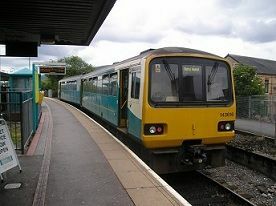 Description: The line starts off at Shrewsbury and passes through the Welsh Marches and into mid-Wales. 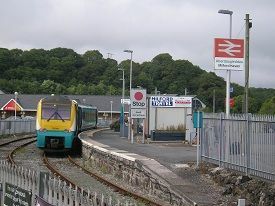 It then moves south westwards through the mountains and emerges at Llanelli, where it reverses and goes east to Swansea and ultimately to Cardiff. Description - A long branch line of almost forty miles which goes northwards from Exeter to the North Devon town of Barnstaple, running along the valley of the rivers Creedy, Yeo and Taw for much of its journey. 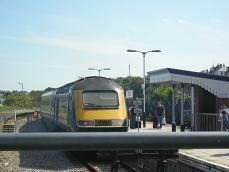 Description: This pleasant branch line goes south from Exeter running next to the estuary of the river Exe to terminate at the seadie resort of Exmouth. Description: The line follows the Tarka Line as far as Coleford Junction where it branches off on the usually freight only line to Meldon Quarry. 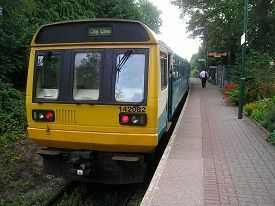 It passes through Sampford Courteney station as it climbs up onto Dartmoor and then stops at Okehampton. This has been a sundays only service in the summer sponsored by Devon County Council. 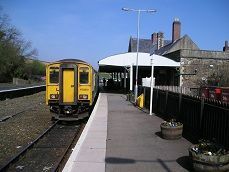 The Dartmoor Railway has run steam trains from Okehampton to Meldon Quarry until 2008. 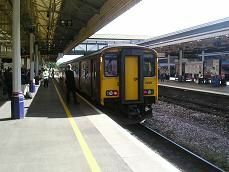 Description: This line moves north from Plymouth and follows the picturesque Tamar valley up into the hils of Dartmoor, crossing from Devon into Cornwall. History: This line started as a mineral railway from Moorswater, just north of Liskeard and ran under the Penzance main line to Looe. 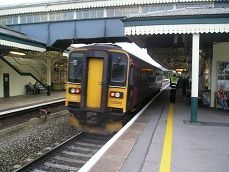 It was joined to the main line at Liskeard in 1909. 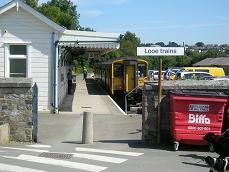 Description: This beautiful Cornish branch line moves south from Liskeard and runs parallel to the river Looe all the way to the port of Looe. Trivia: The train leaving Liskeard goes north then east before going under the main line to Coombe Halt where the train reverses and heads south to Looe. The GWR had plans to build a direct line from St Germans to Looe in the 1930's but they did not come to fruition. Description: This branch line goes north from Maidenhead to Bourne End, where it then goes along the side of the river Thames to Marlow. 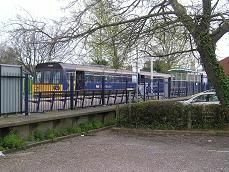 History: Originally the line went from Maidenhead through to High Wycombe, with the branch to Marlow starting at Bourne End. 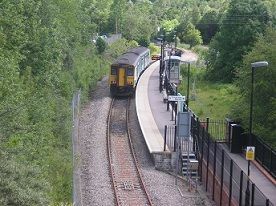 The line from Bourne End to High Wycombe closed in the 1960's, so now the train reverses at Bourne End. 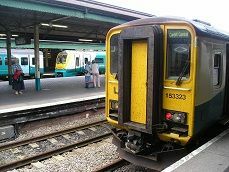 History: The Dartmouth and Torquay was formed in the 1850's and in August 1859 the first passenger trains began to travel through Torquay to Paignton. 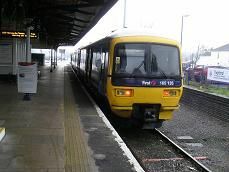 The line from Paignton via Goodrington Sands to Kinsgswear was closed by British Rail in 1972 but was reopened as the Dart Valley Light Railway a few months later. 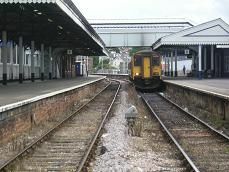 Description: A short but interesting branch line which goes downhill for most of the way from Newton Abbot to the Torbay area, passing along the coast in places. Trivia: Over 16,000 passengers arrived at Torquay/Paignton stations on Saturday 10th August 1957 - the equivalent of over 25 trains! History: In June 1876 a line was opened from Fowey via Par to Newquay by the Cornish Minerals Railway. 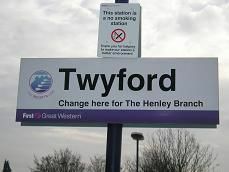 It was taken over on 1st July 1896 by the Great Western Railway. Description: This Cornish branch line goes west from Par on the Cornish mainline through China Clay country to the Atlantic coast at Newquay. Trivia: Due to several speed restrictions this line is the slowest journey by railway in Britain, taking almost an hour to travel the 20 miles of track! 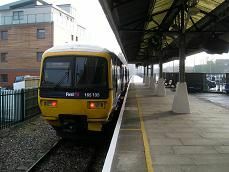 Description: This short branch line of just a couple of miles moves south from Slough over a few fields before it reaches the historic town of Windsor. 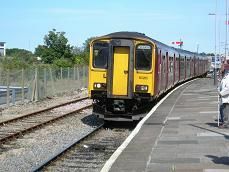 History: The line was first opened in June 1877 by the West Cornish Railway, carrying both goods and passengers as soon as it opened. It was the last line in Cornwall to be built as a broad gauge railway and helped turn St Ives from a small fishing village into a popular seaside resort. In the 1960's it was due to be closed under the Beeching cuts, but was given a reprieve by the then transport minister, Barbara Castle. 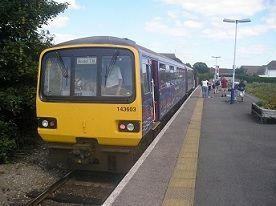 It is now the busiest branch line in Cornwall. Description: Sometimes called "the branch line with the most stunning views in the whole of England", this branch line is a must for anyone who enjoys travelling on branch lines. 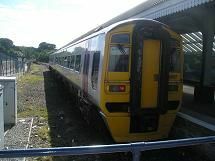 It starts at St Erth on the Cornish mainline and travels alongside the estuary of the River Hayle before reaching the Atlantic Ocean, passing several breathtaking beaches as it clings to the cliffside before arriving at St Ives. Trivia: In 1978 Lelant Saltings station became the first station to have "Park and Ride" facilities to ease parking congestion in St Ives. Description: This Cornish branch line moves south from the cathedral city of Truro, passing over several viaducts and through some tunnels before it emerges at the port of Falmouth on the coast. History: Falmouth was originally the mail port for the West Indies, but lost trade to Southampton, which was nearer to London and other parts of the country. So a railway was proposed to make the port more important again. However in 1846 when the navvies first began work there were riots against the railway! It was eventually finished in 1863. The eight viaducts along the line were originally built with timber. These were not changed to metal until 1934. Description: This is the first branch line to leave the Western Mainline out of Paddington, passing through buiit up areas to join the old GWR mainline and Central Line at Greenford. Description - This branch line travels north from the Western main line at Twyford and reaches the River Thames at Henley-on-Thames. 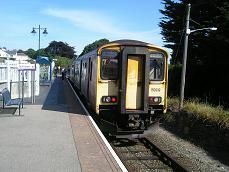 Description: A picturesque line in South West Wales, which twists and turns on its route south westwards to the Pembrokeshire Coast.